Some consider wine drinking an art. I happen to agree... Some wine aromas are simply too abstract for me. Some also consider wine glasses an art form. I happen to agree with that, too...so many shapes and sizes, and colors...way beyond just being functional! But, not as many consider wine buckets or ice buckets as an artsy expression. I do! I came up with a long list of buckets I like while working on this piece. I will tell you just a few, for now. YOU GOT YOURS, AND I GOT MINE! Is your bucket list filled with too many things to do and too many places to go? And, let's face it. 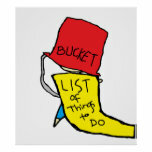 Is it really a 'bucket list' or some unrealistic 'wish list'? 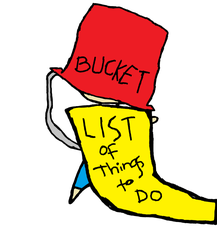 While I am a big fan of the movie, "The Bucket List", and like the idea of having a bucket list, I also found a way to make that list shorter without much compromise. Life is to enjoy, no matter where you are. Your bucket list says you should be in Tuscany drinking with a gorgeous Italian man, but you are stuck in your apartment, out of nowhere, drinking with your cat? Find a nice bucket and chill... your wine and yourself. Even if you are certain that you are sitting in a 'valley' of your life, you can make things better. Just make sure that you have a nice bucket with you...chilled with your choice of wine, especially Champagne or other sparkling wine... or sweet wines with your chocolate, just dry light wines, or no chill necessary Cabernet Sauvignon! I guess this is for alcohol drinkers... but OK. Get sparkling apple cider if you insist on not drinking. My idea isn't to try to encourage drunkenness... There is a reason people consider something like Champagne as one of finer things in life... You can create special moments on your own, anytime, anywhere. No real Champagne necessary.... any sparkling wine in a nice looking glass...sitting in a nice looking bucket. They are hard to miss... they look like buckets. But, they come in every style and color imaginable. Stainless steel buckets have a cool shiny look and can be used in any occassion... kinda like your kitchenwares. They look simply elegant. Then, there are fancy buckets coated from silver or even made with silver... Big pain shining them, but you are right. Some metals are just more precious than others. Having a wine cooler (or wine bucket) near your drinking environment helps keep those wines cool... and beautiful buckets make a very interesting conversation piece and they are also very nice to look at. But, if you drink wine everyday with meals or before/after meals with appetizers/desserts, you are likely to find your wine buckets as essential items for dining pleasure. So, why wouldn't they be as important as your plates or glasses? ONE OF THE COOLEST I'VE SEEN! HINT: It is a big wine glass. The baskets can be important... depending on the wine. Some really well aged wines are fragile with much movement. So, baskets are used to bring your wine from your wine cellar.. just the way they were kept... just hanging out aging... just like me. But, baskets are also useful to carry and keep a few choice of wines on the table together. You can pick wines you are interested in advance before your guests show up. And, when the bottles are empty, you can tell your good neighbor that it is time for him to leave... or just start singing, "Hit the road, Jack... Don't you come back no more... unless you bring replacement wines." A nice wine basket filled with nice wine makes a very good center piece sometimes. The stand is usually accompanied by a bucket. It stands next to you and keeps the dining table free with more space. And, it also does not leave a ring, a square, or a triangle like a regular bucket. So, if you happen to have nice enough furniture where you don't like putting linens over it (to show off), then you really need a stand. Once you invest in one that is classy, sturdy, and good quality, then, the stand can last a long time... probably all through your wine drinking days. Get a good one. You don't want to ruin a perfectly nice evening with an unstable stand that breaks that precious wine bottle of yours. Wine buckets are very functional items, and we rarely recognize them or appreciate them. They will be around to serve you well, just like a good old butler. You will also notice how inconvenient it can be without a good wine bucket... on a sunny day having a long conversation with your friend... and just notice your lukewarm white wine? Yep. I sound fussy. But, wines are fussy drinks. But, there is something very soothing and relaxing about wine, and it is for us to find out the joy, even after a hard day of working... or especially after a hard day of working! I have a very long list of wine buckets, but you don't have to be a genius to pick one you like... It is really hard to go WRONG choosing a bucket! COME JOIN AND HAVE A BLAST!